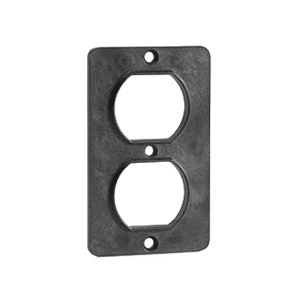 Leviton 1-Gang Standard size coverplate in black color, features polycarbonate construction. This rectangle coverplate measures 2.25-Inch x 3.65-Inch x 0.205-Inch. Screw mountable coverplate has one duplex receptacle configuration. It withstands temperature rating of -40 to 100 deg C. It is V0 flammability rated to withstand harsh environmental conditions. It is suitable for use on 3000 Series portable outlet box. Coverplate is UL listed and RoHS compliant.